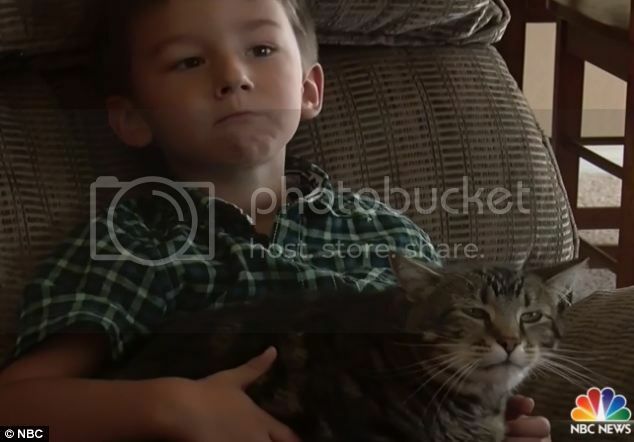 A cat came to her best friend's rescue Tuesday when a young boy was attacked by a dog in his driveway in Southwest Bakersfield and it was all caught on video. The neighbor's dog, an 8-month-old labrador/chow mix, sneaks up behind him and bites his leg. The family's cat, named Tara, rushes the attacking dog and chased it away. "Tara is my hero," Jeremy said. The boy's mother, Erica Triantafilo, was outside at the time. She said the dog was still hanging around and she tried to chase it away and it bit her as well. 11:34 AM PT -- We're told the dog was picked up Tuesday by animal control -- in an extremely aggressive state -- and a decision has been made to euthanize the animal. Guard cat, seriously serious, watch the cat’s serious behavior, like a human Marine sentry. First the critical attack against the dog, at the cat’s own risk to it’s life to rescue the 4 year old child, then back to check on victim and cat remains by victim’s side until retreat, even though mother retreated first, oddly, and then cat retreats, escorting victim to assist in cover protection. This is a wholly unexpected outright intelligent pack behavior from a cat, who clearly attached to his family, especially specifically the 4 year old child. This is a very unique behavior special sequence, from front to back, a lot here on this one, with amazing implications. 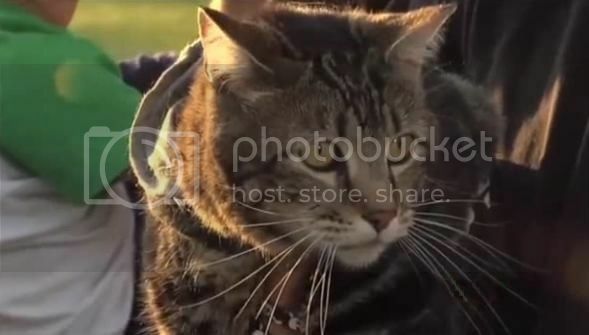 Tara the cat, who saved a four-year-old boy from a vicious dog attack that was caught on camera is to 'throw first pitch' at a minor league baseball game next week. The famous feline will be accompanied by her owner's son Jeremy at a Bakersfield Blaze home game at Sam Lynn Ballpark on Tuesday in Bakersfield, California. On Wednesday, she became the nation's most beloved cat when surveillance footage emerged showing her saving their son Jeremy by pouncing on the neighbor's dog as it attacked him. Yesterday Tara's owners said she has been best friends with Jeremy since he was born. She followed Erica and Roger Triantafilo home from a park about six years ago and has been a member of the family ever since, they said. On Thursday, Jeremy snoozed his way through his first live interview on the Today show as his parents described their shock at Tara's act of bravery. What an amazing cat! I wonder why the dog attacked him? What horrible injuries the dog inflicted. Seems like the right decision to put the dog down. SAN FRANCISCO (MarketWatch) — Everyone wants to know how to make something go viral on the Internet, from giant media and tech corporations to small startups looking for publicity to consumers who would like to make a quick buck or have 15 minutes of fame. So the instant popularity of the video of the cat in Bakersfield, Calif. , fighting off a dog attacking a 4-year-old boy may have some scratching their heads wondering how the grainy, 45-second video from a security camera has become one of the fastest-growing Internet videos, and went viral five times faster than the “Gangnam Style” video by South Korean musician Psy. “This is a really interesting case,” said Ben Kaplan, founder and CEO PR Hacker , a publicity firm in San Francisco focused on making stories go viral. “It was mass media working together with social media in a way that hadn’t happened before.” Kaplan created a time line of how the video went quickly from the first post at 5:03 a.m. on the website of KERO-TV, a local station in the agricultural town of Bakersfield, to mass media and NBC News at 11:20 a.m.